Some of our guests are early risers these days with temps in the mid-80’s, late afternoon thunderstorms and Hoot Owl restrictions on some sections of rivers in southwest Montana. Attached is from Fish, Wildlife and Parks, explaining the restrictions as of July 1. 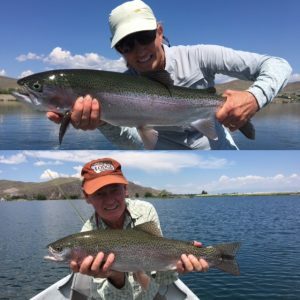 Healing Waters Lodge has many options at available such as access to private water (Sharon and Bruce pictured on private water) and the Ruby, Beaverhead, Big Hole, Jefferson, and Madison rivers. So much water, and so little time, so be our guest at Healing Waters Lodge or book day trips with us. Give Mike Geary a call at 406-459-2030.